In lightweight buildings, fire protection is generally achieved by the use of fire-resistant linings. Due to the sequencing of trades in constructing fire- and sound-rated timber buildings, it is not always possible to provide complete coverage with fire-resistant linings, as framing elements often get in the way. The Building Code of Australia also has a requirement that a construction joint, which is what is being described here (Provision C3.16, Volume 1) is required to be fire resisting with respect to integrity and insulation. Solid timber has been researched and tested, and has been shown in some cases to provide equivalent or better performance than fire-resistant linings in these situations. It is mainly used where linings stop at junctions between walls, roofs, ceilings and floor elements, or where walls abut other walls. Additional informatiuon and resources are on the Design for Fire page. 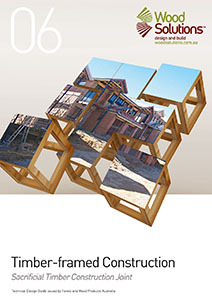 This guide provides standard details for common locations where timber sacrificial blocks can be used to form these construction joints in walls and floors for Fire Resistance Levels of 60/60/60 and 90/90/90. It also provides typical thickness details and locations for sacrificial-timber blocks as well as any other associated construction needs to support nearby linings or to fill related voids.